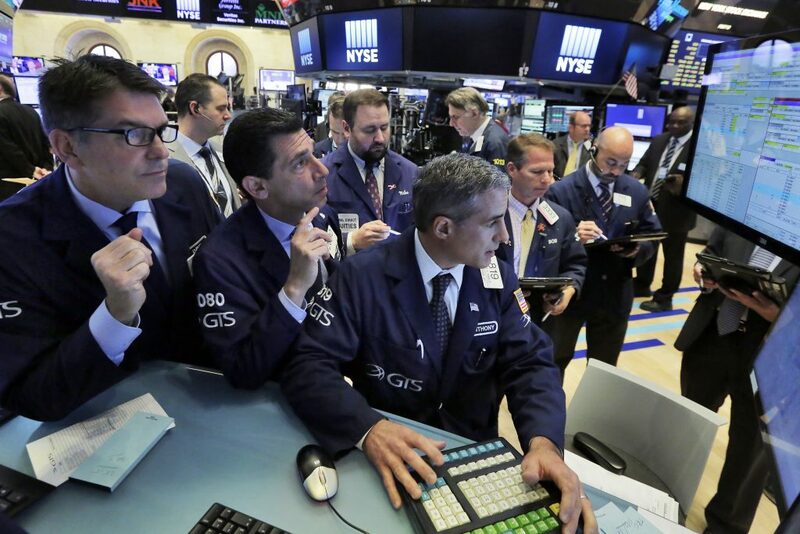 U.S. stock indexes were mixed in afternoon trading Wednesday after another dive for energy stocks offset gains for health care and technology stocks. Bond yields held steady, while stocks in mainland China got a small boost after they got the OK to join a widely-followed index of emerging-market stocks. KEEPING SCORE: The Standard & Poor’s 500 index dipped 3 points, or 0.1 percent, to 2,433, as of 1:05 p.m. Eastern time. The Dow Jones industrial average was down 57 points, or 0.3 percent, at 21,410; and the Nasdaq composite rose 29, or 0.5 percent, to 6,217. CRUDE WORRIES: The price of oil sank again, a day after dropping to its lowest price of the year on expectations that supplies will continue to outweigh demand. After being up by as much as 1.6 percent earlier in the day, benchmark U.S. crude turned lower and was down $1.06, or 2.4 percent, to $42.4 per barrel. Brent crude, the international standard, fell $1.29 to $44.73. Energy stocks bore the brunt for a second straight day, and those in the S&P 500 lost 1.6 percent, a day after falling 1.2 percent. They are now down nearly 15 percent for the year, while the overall S&P 500 is up 8.7 percent. SLIDING PROFIT POTENTIAL: The price of oil has now dropped more than 20 percent this year, breaking into what traders call a “bear market.” How much of an impact that will have on the overall stock market will depend on how much it will undercut energy companies’ profits. Accelerating corporate profits have been a big reason for the stock market’s gains this year, and energy companies had been forecast to provide some of the biggest gains. OPENING UP: Red Hat, an open-source software company, surged to one of the biggest gains in the S&P 500 after reporting better-than-expected earnings for its latest quarter. Its forecast for revenue and earnings this fiscal year also topped analysts’ expectations. Its stock rose $9.04, or 10 percent, to $99.00. FLASHING HIGHER: Adobe Systems jumped $2.38, or 1.7 percent, to $143.29, after reporting stronger revenue and earnings for its latest quarter than analysts expected. GETTING ACTIVE: La-Z-Boy jumped $4.97, or 19 percent, to $31.17, after reporting quarterly earnings that easily topped analysts’ expectations. Its customers have been shifting toward higher-priced and more profitable products, such as leather. CHINA’S ARRIVAL: Chinese shares traded in Shanghai, which have long been difficult for foreign investors to trade, rose 0.5 percent after index provider MSCI said it will include 222 of what are called “Chinese A-shares” in its widely followed Emerging Markets index. The move, which will begin next year, will likely cause big shifts of money into mainland Chinese stocks by mutual funds and other investors that track the index. MSCI has been considering including A-shares in its index for years but had demurred until now due to a range of concerns. China has since started a “Stock Connect” program that links mainland Chinese stocks with the Hong Kong market to make them more accessible, among other changes. OTHER MARKETS ABROAD: In Europe, France’s CAC 40 fell 0.4 percent, Germany’s DAX lost 0.3 percent and the FTSE 100 in London slipped 0.3 percent. In Asia, Japan’s Nikkei 225 index fell 0.5 percent, South Korea’s Kospi lost 0.5 percent and the Hang Seng in Hong Kong dropped 0.6 percent. TREASURY YIELDS: The 10-year Treasury yield dipped to 2.15 percent from 2.16 percent late Tuesday. The two-year yield rose was flat at 1.35 percent, and the 30-year yield fell to 2.73 percent from 2.74 percent. CURRENCIES: The British pound rose to $1.2660 from $1.2629 late Wednesday. The euro rose to $1.1144 from $1.1128, and the dollar dipped to 111.39 Japanese yen from 111.41 yen. COMMODITIES: Gold rose $2.50 to $1,246.00 per ounce, silver slipped 6 cents to $16.36 per ounce and copper added 5 cents to $2.61 per pound. Natural gas fell 1 cent to $2.90 per 1,000 cubic feet, heating oil lost 3 cents to $1.37 per gallon and wholesale gasoline fell 2 cents to $1.41 per gallon.